WE headed south-west out of Lhasa this morning along the Lhasa River. Now we are following the Yarlang Tsampo before we start climbing. 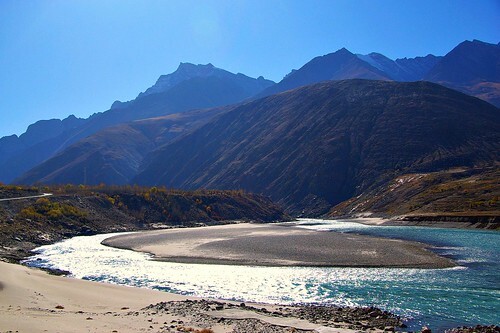 The Yarlung Tsampo is credited with being the world's highest great river. It runs from west to east along the north of the Himalayas, fed by the glaciers and melting snows,before turning abruptly south in the far east of Tibet and plunging down across the border into India where it becomes the Brahmaputra.